« Bist du ein Berliner? Michael IJsbrand Cornelius Rogge (IJsbrand is written like that: IJ is a Dutch vowel) left Holland in 1949, at the age of 20, to work for the Nederlandsch-Indische Handelsbank in Hong Kong. He spent six years in Hong Kong and moved to Japan, where he lived from 1955 to 1960. In 1961 he returned to Holland. He is now 79. He is also a photographer and filmmaker (and a believer in the “paranormal”). 130 video clips, mainly black and white, some colour, of his travels are on YouTube. Here he lists DVDs from which the clips are taken: you can order them. One or two of the clips have English voiceover. Rogge himself appears in one or two. Some have been shown on Dutch television. A written autobiography in Dutch starts here, an English version here. Hong Kong has the biggest share. Seeing film of Asian cities as they were one or two generations ago is enthralling if you know them now, because it requires less effort to imagine them as they were a century ago than as they were in 1950, ’60, ’70 or ’80. I first saw Hong Kong in early ’84 and went there about fifty times between then and 1997. Since the handover, I have been back only twice or three times. I first saw Singapore in ’84 and must have been there twenty-five times. Singapore has changed even more dramatically than Hong Kong. What strikes people who come to them now from Dubai or parts of mainland China is that there are few cranes, at least in the centre. They have been built, or rebuilt, and may change more slowly in future. But it may only be a lull. The clip at the top is from a film called Rain: Hong Kong in 1952. You see one of the colony’s ubiquitous Rolls Royces. Here are more. Select High Quality wherever you can. I’ll elaborate some of Rogge’s brief descriptions. Walking to the bank. Rogge in 1949. Battery Path to Des Voeux Road. The bottom of Battery Path is still recognisable (or is from when I knew Hong Kong). The opening shot shows a view of the harbour with the old Hongkong and Shanghai Banking Corporation building (1935) dominating the scene. No Bank of China next to it, because the BOC wasn’t yet built. 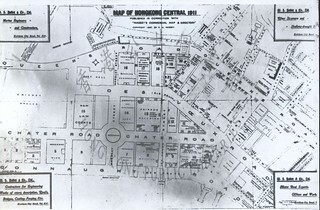 Central, 1949. 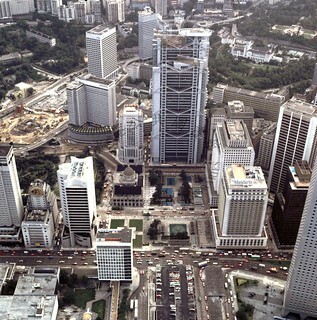 On the left in the opening shot are HKSB again and the old Bank of China building (1952). The latter pointedly put up by the new Communist government – and made taller than HKSB. The date here of 1949 must be wrong. Both were still standing when I went to Hong Kong in early 1984. The new Hongkong Bank headquarters (Norman Foster) opened in 1986. The new Bank of China Tower (IM Pei) opened in 1990 – and pointedly towered over Hongkong Bank. At 18 seconds into this clip, we get closer views of HKSB. 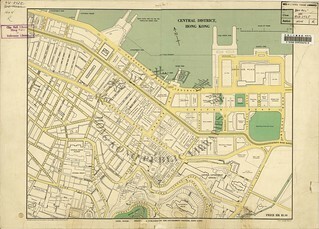 Then, according to Rogge, we see Des Voeux Road, Statue Square, Gloucester Road, and the Cricket Club. We see Bank of China from Statue Square, looming behind the Supreme Court Building (1912). The Supreme Court was on the south side of the square. It still stands and now houses the Legislative Council. We see the Cenotaph (1923). Statue Square used to face the sea directly; because of land reclamation, it no longer does. The Cricket Club is where the rather messy Chater Garden (old Furama, old Hilton, Ritz-Carlton) now is, east of Hongkong Bank and Legco. It opened there in 1851 and did not move out of Central until 1975. The removal of the Cricket Club and demolition of buildings around it was the biggest change in Central since the foundation of Hong Kong. Here, from the Club website, is the Club still functioning in its home in the early ’70s. The date must be between 1972 – that, at least, is when the round-windowed Jardine House (the “washing machine”), which you can see behind the pavilion, opened – and ’75. It’s strange to realise that in 1972 Jardine House was not only the tallest building in Hong Kong (taller than Bank of China), but the tallest in Asia. The old building to the right of the pavilion must be the Hong Kong Club. You also see it in Rogge’s film. Hong Kong office 1952. Rogge’s bank had moved to new offices in Marina House, Queen’s Road. The management was Dutch. Most of the employees were Portuguese. Marina House (1935) – along with Gloucester Building, Windsor House, Lane Crawford House and Edinburgh House – was demolished in the late ’70s to make way for The Landmark. Music: Leroy Anderson, The Typewriter. Demolition, Hong Kong, 1960; Kowloon jewelry shops. Begins with a shot of the Hong Kong Club. Its first premises had been at the corner of Wyndham Street and Queen’s Road, opposite the pre-1912 Supreme Court. In 1846 this had been one of the first important buildings in Hong Kong. A new building, in Statue Square opposite the Cenotaph, opened in 1897. It was one of the grandest of the Hong Kong loggia buildings and one of the last to go: it was demolished in 1981, against, for Hong Kong, unprecedented resistance. We see the side of the Club 18 seconds into this clip. The Club now occupies part of the new, ugly, building which was put up after 1981 on the same site. What is the demolished building on the west side of Statue Square shown 31 seconds in, on the site of the present Prince’s Building (1965)? Hong Kong waterfront 1950. French aircraft-carrier. Kowloon 1951. Nathan Road. Fairground. Ho Man Tin Hill Road (Rogge says something about a printing-house called Labrum there) and, behind it on the hill, a veritable favela, long gone. The mainland – Kowloon and the New Territories – as well as Hong Kong Island, housed post-1949 refugees from China. Hong Kong 1952. Building boom. Scaffolding in Ice House Street. Lantau Island 1952. The Po Ling Shi Buddhist monastery, since rebuilt. Hong Kong has more real countryside than Singapore. Hong Kong Coronation festivities 1953. Procession to celebrate the coronation of Queen Elizabeth II, attended by the Governor, Sir Alexander Grantham (not Graham as Rogge says), at the HKSB building, filmed by HK Amateur Cine Club members. Music: Walton, Orb & Sceptre. The Shek Kip Mei fire in 1953, which made 53,000 squatters homeless. Music: Eroica. By car to Aberdeen fishing village, Hong Kong island, 1953. Hong Kong Botanical Gardens 1953. At Mid-Levels on the northern slope of Victoria Peak. We are shown another cricket ground there. This clip conveys particularly clearly the feeling of a quieter and calmer place than modern Hong Kong. A Gospel Boat of the Oriental Boat Mission, which spread Christianity among Hong Kong’s boat people. Commentary by Miss Stephany Czechowitz. 1953. Hong Kong 1960, and Bank of China strike. “Queen’s Road and Des Voeux Road at lunchtime in the old days. Employees strike for higher pay at the Bank of China.” But the voiceover says that these strikers were factory workers protesting at the Bank of China. Macau 1960, when it was a Portuguese colony. The Portuguese flavour was still present when I first went there, c 1987. So was a laid-back colonial administration. You crossed the Pearl River estuary from Hong Kong by ferry or hydrofoil. There was a Praia Grande, and trees, a coastal road, and one or two restaurants, that might have been in Portugal, and a not especially seductive sleaziness, but hardly any Portuguese. Harbour. Ma-Kwok temple. Façade of St Paul’s Cathedral. Chiang Kai Shek’s portrait. Firecracker industry. Ferry with refugees heading for Hong Kong. Singapore 1960. Loading the Dutch freighter Oldekerk. The downtown waterfront. Death in Singapore, 1960. Making coffins in Sago Street. A funeral during the monsoon. Singapore 1961. A Hindu gets a haircut. Backstreet boys gamble. A parrot. Old Singapore and Raffles Hotel in 1961. When you look at some of the scenes, you can see why most Singaporeans are not sentimental. But Singapore went a little too far in its rebuilding. The strange thing is that Singapore was the most photogenic colony the British ever had (these clips don’t show this). The settled life of the Straits Chinese made for more interesting old photographs than the frantic scramble of Hong Kong. Port Swettenham, now Port Klang, Selangor, 1960. Demonstrations in Jakarta, Merdeka Square, 1955. There are only a few Japanese clips and, sadly, none from Korea. This entry was posted on	June 15 2008 at 4:14 pm	and is filed under China, Historiography, Japan, Southeast Asia. Other old Central landmarks. Swire House (1962) has recently been demolished and replaced by Chater House. The Mandarin (1963) survives. Thanks for your email. I knew your kind words on this site and have always wanted to thank you for it. I’m not a Theosophist any more, but do believe in the paranormal to a major extent. The number of my video clips has grown now to over 180. There are many Japan clips too, including a satire on my life in Kobe. Anyhow I appreciate very much the attention you have given to my work. Michael, Thank you! I have taken out the reference to theosophy. You don’t refer to what I think is a mistake in the dating of the film called Central 1949.
and it was amazed to find that the original name of the street standing across the statue square was called “wasrdly street”, which is now a part of the statue square’s walkway…. any demand of samples contact us without any hesitation. I am not having success in setting up an account on YouTube to comment on Mr. Rogge there and so am leaving a comment here for him, if you will please pardon me. Regarding the movie of the children’s party in Wanchai from 1953 that was put on by the JCs and Boy Scouts. My father (born 1926) was a Scout Master and lived in Wanchai. There is a photo in the movie which catches the side of a man on the left side of the frame that looks very much like my father … leaves me wondering. Thank you. Sounds fascinating. You can email Michael Rogge at manandu@xs4all.nl. I was born in the UK and came across your footage and photos of Hong Kong in the 50s. I was wondering if you had any footage of lai chi kok, wai man village(tseun) or the butterfly valley village (wu tip kuk)? My father was born in the 1950s and left for England when he was 12, from a very poor background and I have been desperately trying to search for an old photo/s from that time. Thank you. And thank you for all the films!